I have had two surgeries this summer that have really impacted my work and daily life. I only consent to surgery if it is a problem severe enough that I can't function or will kill me and the first one was for that. I found a highly skilled surgeon who had done more of the procedures than occur in most countries in the world. The procedure itself seemed to go surprisingly well. He gave me a prescription for oxycodone but the only treatment I needed for post op pain was acetaminophen. I went in to see him a month later and everything was still going very well. No surgical complications and the target symptoms were in good remission. I did well for another 2 weeks and then got symptomatic again. I was reexamined and the original surgery had scarred over requiring a second surgery to remove the scar tissue. He explained that is was very rare in his practice for that to happen, but that he did need to fix is as soon as possible. The second surgery as done and I was functioning as good as new again. He advised me to come back in 6 months for follow up. There were post operative complications. Despite antibiotic prophylaxis given during surgery I developed an infection with a fever and tachycardia. He prescribed antibiotics but it got worse. I eventually went into the emergency department at midnight and was given intravenous Rocephin and told to continue the oral antibiotics until they were gone. The infection cleared up in about 5 days. Me: "The symptoms are back, at about the same time frame and course of onset as they were in the past. Do I need surgery again?" Surgeon: "Well probably. It is highly unusual that it happened the first time and even more unusual if this has happened again. I will just schedule the OR so we can take care of it early next week. Can you do it then." Me: "Well yes - I will do whatever I need to do to take care of this problem. I can't really go on like this." Surgeon: "I was just talking with my partner here and we need to alter the procedure to really remove more tissue when we take out the scar tissue this time. We really need to open that area up"
He sounded a little shaken. He is a top surgeon in his field and this is not just one complication but a second complication of the same initial surgery. He was consulting his colleague and in this group all of the surgeons are very experienced and highly regarded. I wondered if he was concerned about what I was thinking? He was safe there - even though it is practically an American standard to blame surgeons for sub-optimal outcomes that was never going to happen. I have seen surgeons with less skill than others and I picked him because of his record. There was no way that I was not going to let him do his job or suggest that I was in any way dissatisfied with his work. I started to think about all of my years in acute care and how common it was to walk in the door in the morning and get blamed for everything by people who I have never seen before. People who were there because they were in an alcohol or drug induced state and ended up under my care because there were unsafe and needed to be detoxified and in some cases treated for the psychiatric complications of substance use. People who were admitted for severe psychiatric disorders and associated aggressive or suicidal behavior. Once they learned I was their psychiatrist - it was my fault that they were there - even though it was my job to get them out of there as soon as possible. My failure to do that resulted in a second tier of blame. This time by hospital administrators who were often quite aggressive in encouraging me to get patients out of the hospital whether I though they were stable or not. Shortly before I left the job, one of them actually told me that if I did not get the patient out - he would come down and discharge the patient himself. I smiled to myself at that point and realized it was a very good thing that I was not blaming my surgeon for anything. And then I thought about being in the same situation. Most people who have not practiced in acute care have not seen some of the problems that have no solutions. Aggressive behavior that does not respond to medications. Catatonic behavior that rapidly leads to life threatening dehydration or starvation. Bipolar patients on dialysis who are delirious for months waiting for kidney transplants. Patients with multiple medical complications who are agitated and can't sleep. On some days an endless list of problems that would keep me up all night long trying to figure out solutions. I would call and email one of three colleagues who I knew I could count on. They had been working acute care as long as me and I always appreciate their input. We only consulted one another in situations where we had no obvious solutions and we also had a sense of dread. Dread in the sense that you start to ask yourself: "Is there really no solution here? What am I missing? Have I lost it? Do I need to take a break and work somewhere else for awhile?" There were a lot of nights where I would just lay in bed, thinking about the situation - sensing the blood pulsate throughout my body and feeling a light sweat on my skin. I would get out of bed in the morning amped up on adrenaline and feeling like I had slept for 8 hours when it was probably closer to 1 or 2. Luckily in my case, there was resolution. It could happen after a couple of sleepless nights. On many of those nights I would have contact with the nursing staff to see if any modifications could be done while I was away. I would finally get a break and things would be all right for 2-4 weeks before another crisis hit. It would usually be a surprise. I walk into the unit in the morning and hear "Mr/Mrs Smith is up out of bed eating this morning. They made a big turnaround last night." Hoping for that break is the only thing that kept me going. You can only tell yourself that you have done everything right for so long. I never got to the point where I expected that break. It always struck me as very lonely and bleak. My senses seem dulled and everything slowed down around that problem. When the break happened - life was finally good again. 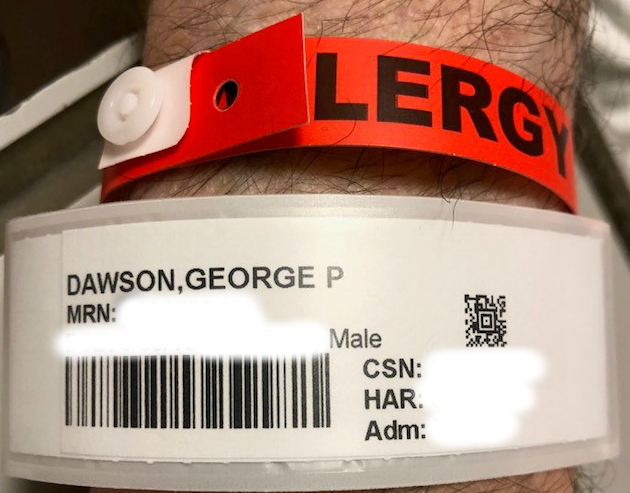 I was able to step back from these associations and realize that my surgeon was likely experiencing some of the dread I typically encountered in acute care. Despite extended and best efforts - things are not going well and you don't really know why. There are no easy or apparent solutions. Surgeon: "I should probably see you tomorrow before the surgery. I am sorry this happened. Can you be there are 7:30?" Me: "Thanks. Yeah I can be there at 7:30. See you then." I was very calm and I slept well that night. 1. Above image as my second preop identification and allergy band. 2. Image for Twitter post was from Shutterstock per their standard agreement by Francey Scary Foggy Road downloaded on 10/14/2018. Consider answering this little "gem" thrown at me this AM, Monday AM that is: I saw a 17 year old female early last week, who has a history of sensitivity to meds in general, no psych meds given to her though, and for the sake of space and time, felt she might be a good candidate for fluoxetine (Prozac to readers) and to be on safe side titrate, as I always do, from lowest dose of 5mg and up to 20mg in a few weeks time, by 5mg and wrote, obviously, for tabs. So, the insurer sends a denial and basically writes this is not the first choice of meds and even so should be using capsules and thus start a higher dose. NOT GOING TO HAPPEN, I wrote a challenge of the denial asking for the alleged MDs name and literature to support this claim and how it could impact on suicidality issues in adolescents, and will see if they react as I hope when I wrote about medical necessity and if I have the term right, Respondant Superior in taking on a supervisory role in the patient's care. Curious if you would comment, if not fine as well, but, the point here, insurers are taking on legitimate clinical roles in interfering with care and there has to be a lawyer who can use this as precedent, but, that infers a negative outcome and not being the test case here! There is active ongoing commentary about the inappropriate intrusions into clinical care by MCOs and PBMs including overruling the clinical judgment of the physician and also massive (90 day prescriptions) the only indication seeming that it saves the mailer postage fees. When I get a history of AD sensitivity, I also go with the lowest dose and review with the patient that they should have a very low threshold for calling me with any side effects. In a young person new suicidal ideation is an FDA warning that I discuss with them. One of the things keeping all of these business intrusions going is ERISA and protection of these businesses from liability. That is why they can afford to strong-arm clinicians.